The Big Dreams, Big Prayers Bible for Kids, NIV includes the complete New International Version (NIV) of the Bible along with devotions, prayers, and highlighted verses to help kids pray and listen for God’s answers to their prayers. 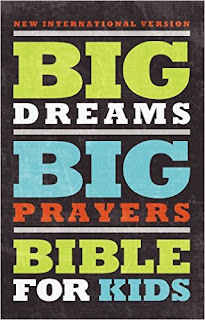 NIV, Big Dreams, Big Prayers Bible for Kids by Zondervan is an awesome Bible! I love all the features of this Bible! The highlighted verses are great for memorization and I've been amazed at how quickly my eight year old has begun to memorize some of these verses. There's also book introductions the explain what each book of the Bible is about which is great for kids. My favorite park is the prayer journaling page so that kids can record their personal prayers as well as answers to their prayers. The reading plans are also wonderful and I also love that kids are reminded to pray for others and themselves. NIV, Big Dreams, Big Prayers Bible for Kids by Zondervan is an excellent Bible and I highly recommend it! 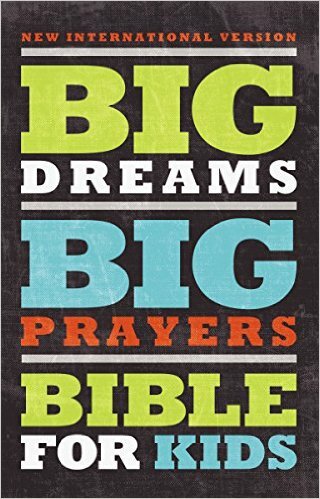 You can find NIV, Big Dreams, Big Prayers Bible for Kids by Zondervan on Amazon, Barnes and Noble and other bookstores.